Amy was a pure joy to work with! Her professionalism and follow-thru was absolutely amazing. Amy paid attention to detail and provided us with reasonable solutions while listening and respecting our wishes. This was an exceptionally difficult home to sell for a variety of reasons and Amy sold itwithin 1 month! Her dedication and work ethic is something to be admired. I will be recommending Amy to everyone both selling and looking for home. Amy was very knowledgeable and helpful to us as we bought and sold houses with her this summer. She was our advocate in both situations and helped guide us every step of the way. She has wonderful people that she works with to assist with getting a home ready to sell! Amy was available to answerquestions at any time and did everything she could to make our experiences positive. We have ended up in our dream home and we sold our first home in three days! I would absolutely work with her again and I am recommending her to any of my friends that are pondering the real estate market. Amy was awesome to work with! We felt comfortable from the beginning with her down to earth personality, yet strong professionalism during the process. She helped us to sell our home and find a new home with some pretty unique requirements in a time span of 3 months. We even closed on both houses the same day! Amy was always available and there for all that was required on both efforts such as attending inspections, closings, working with our lender etc. It would not have gone so smoothly without her. Thank you Amy!! First off, we would like to applaud Amy on her professionalism during our selling process...which was a very tough one, not by the book. We were selling our property in Corrales, and Amy was assigned to us upon contacting Caldwell Banker. We started looking for realtors about 1 to 1.5 years in advance of the formal selling process and interviewed a handful of candidates, some of which came highly recommended. Amy came out on top as our choice. Her generosity, honesty, and straight forward answers to our questions helped inform my wife and I to make timely and quick decisions on how to counter and ultimately accept an offer. The amount of knowledge gained on this transaction for both Amy, and us (sellers) was immense. I can guarantee that if she can handle this situation professionally, then she will handle yours the same. We highly recommend Amy for buying or selling needs. With our future transactions, we will definitely use her. Amy did an amazing job of managing the sale of my home. She was always positive and helped me through the challenges, keeping me grounded at times when I wanted to give up. She is a great supporter! We are so thankful that you were assigned to assist us in buying our home. You and your team not only provided top notch professionalism, but also the feeling of family. We benefited staying teaming up with you because you stayed closely connected with us (checking-in periodically) by tailoring our preferences on Trulia and especially your Coldwell Banker portal so that we could still view the market while we were still out-of-state. We were impressed by your diligence to keep us informed and that you did not give up on us due to the time-line that we had and the logistic circumstances. That was not easy as you had to keep in mind what we wanted in a home, and even changed our minds on occasion about features and areas to search. Your patience was very much appreciated. We would definitely recommend you Amy and your team of professionals because you guys provided us with extremely thorough information and guidance even though we were 900 hundred miles away! You had the ability to put our minds at ease when we worried about things. You were in constant contact with your team realtor, Sandi Pressley when we had questions and concerns that only the owners could answer, which helped tremendously. One important feature that you provide is perseverance and professionalism throughout the entire process, which has gone way beyond the closing date. You connected us with an awesome lender that made our dreams come true, without your foresight and valuable connections we may not be residing in New Mexico at this time. You found a way to work with us when we were having difficulty finding a lender, and you connected us with the right company, which is a true credit to you brilliant networking and wealth of team work. We felt in good hands as you were providing us feedback from your team of inspectors, lenders, and the other Caldwell realtor and staff. Not a detail or deadline was missed. There were things we didn’t even know that had to be done that you informed us about and were taken care of. We were more than satisfied with the services you provided and would certainly refer you to our friends and family. You were very professional with us, but at the same time connected with our son, and welcomed us into to your home for a home cooked meal, which was awesome! 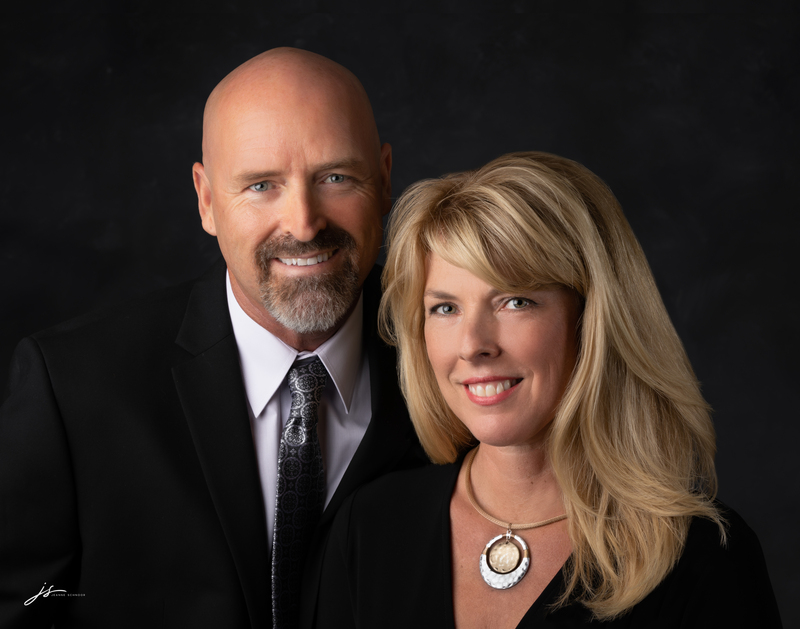 "When we decided to make the retirement move from our Midwest farm to a Rio Rancho, NM home, we searched the internet for a real estate buyer's rep with experience and expertise. Amy O'Connell seemed to fit the bill, and we quickly realized we had made a wise choice. Our initial call to her was warm, welcoming, and Amy was eager to start a search for us. We knew in short time, that she definitely was adamant to find us our perfect nest in the West! She advised us of all things we needed to know as newcomers to the Rio Rancho area, not only the good, but also information on particular zoning, building ordinances, etc. She was available to us for all our questions, no matter how often we called. When our home in Missouri sold more quickly than planned, Amy went into high gear to find us our new home. Because of the time being so short in making our transition to New Mexico, we decided to let Amy be our eyes and we would trust her decision without a trip to New Mexico. We never saw the new house until our closing. Totally a sight-unseen purchase. So very happy......she found us exactly what we wanted and in the price range suited to our needs. If you are looking for knowledgeable, personalized representation in the real estate market, be sure and meet Amy O'Connell. A real gem!" "I moved to Albuquerque from California in 2014. Amy O'Connell from Coldwell Banker Legacy helped me rent the home I eventually bought. Amy and Heather Martinez from Pinnacle Capital Mortgage made my transition from renter to buyer seamless. They guided me with patience and kindness, and were always ready to answer any questions I had about purchasing my home. As my realtor, Amy was present for inspections and came to my home whenever necessary. I really believe that, without Amy and Heather, my dream of home ownership would not have been possible. They both worked within my budget to ensure that owning a home would not be a burden for me. I highly recommend these professionals to anyone who is looking to buy a home. Thanks, Amy and Heather!" Amy was a pleasure to work with! I chose her to sell my home because of her specific knowledge of the Rio Rancho market. Her expertise in what people were looking for guided all of our decisions. Not only did she make repair recommendations, but she also lined up reputable contractors to do the work and did a terrific job getting the house ready for sale, marketing it, getting the right price and walking me through the closing process. She was extremely reliable, on-point, and quick to answer all of my questions. I felt very well taken care of throughout the entire process. I would highly recommend working with Amy! She is a true professional, with a great sense of humor, and has top notch communication skills. You will greatly benefit from her excellent advice, leadership and expertise. After interviewing three realtors regarding selling our home, we met Amy O’Connell. She gave us advice regarding our home and was terrific in helping to prepare the house before putting it on the market. She worked with us to set a little higher dollar price then other comparable houses on the market. It sold within 3-weeks very near our asking price; she did not pressure us in any way to sell it at a lower price. Amy assisted in arranging all the different services that are required in selling a house (which also included calming the nervous elderly sellers). She was highly motivated, very professional and went beyond the call of duty to make it very easy for us to sell the house. She took care of everything including negotiation of a postponed closing date that worked for us. She is a pleasure to work with, is knowledgeable and efficient. We highly recommend her services and look forward to her friendship in the future. Amy’s professionalism, timeliness, attention to detail, and effective communication are only a few of the qualities that make her the best broker imaginable. I can honestly say that I may not have purchased a home if it had not been for working with Amy. I say this because the first several agents I had been in communication with never earned my trust or my confidence. Amy had it almost immediately. I am a first time homebuyer and I only had 2 days in a new town to look at properties. The first day was wasted with another agent. I was in contact with Amy, and within several hours she had already sent me numerous listings that matched my price point and requirements. I narrowed the list down, and the next day we looked at properties until I found the one I loved. I went back to Oklahoma, and within several days we had an offer in that I was very comfortable with. She had contacts who she recommended for inspections and other services that were all completed quickly, accurately, and at a fair price. Amy was in constant communication regarding inspections, she was present for all of them since I couldn’t be, and she advised me very thoroughly on the entire process. I have often heard people talk about the stress of buying home, but I can honestly say my home buying experience was less stressful than buying a cell phone! Amy was very attentive about things I did not even know to look for in a home. On the day of closing she even picked me up in the middle of a hail storm to make it in time! She went above and beyond what I ever would have expected from a broker, and I will always feel lucky to have found her on such a short notice. Amy’s thoughtfulness didn’t stop after the closing either, she’s been in contact several times to ensure things are going well in the new home. If I ever hear of anyone in need of Amy’s services I would not hesitate to recommend her. I know she would work as hard for them as she did for me. Amy’s enthusiasm is wonderful. Very good natured. She is very helpful on real estate transactions. It was a pleasure working with Amy again on the sale of our home. What I liked most about working with you while we were looking for a house was that you listen to me. You developed a portal that listed homes with the features we were looking for. Coming here and having 12 homes to look at was such a comfortable feeling. As we worked together you found additional houses but we kept going back to the house that was top on our list. We think we made a good choice. It is a comfortable home and feels like a good fit. The neighbor's are friendly and many have welcomed us to the neighborhood. Maryellen wrote a very nice response to this. I completely concur! For me the most valuable asset you have is dependability and responsiveness. Whenever we had a hiccup with our bridge loan process you interceded for us and managed to get things accomplished when I had thought we had stalled out. You have stuck with us even up to now, several months since we first met, by connecting us to contractors to repair house problems and also by contacting people who might want our used packing boxes. Without that help, we would never have gotten a car into the garage nor gotten our sink from leaking. Both important from our perspective. I would certainly recommend you to others who could benefit from having an excellent realtor. Our association has been very productive and meeting and working with you is a pleasure! She was even willing to take on our small valued plot of land. Amy was really great to work with and I’m a realtor too!! "Once again, you provided excellent customer service throughout our transaction. Because of your due diligence, we received the loan package from the lender several days early and the transaction closed without interruption! It was refreshing to deal with somebody that kept us informed throughout the closing process; your communication is excellent. I appreciate you and thank you for your professionalism and I look forward to working with you again." "It was a good experience working with you. I was very pleased with the contract you drew up for the house. I would recommend you to my friends and family." "Amy is a joy to work with. She is the ultimate professional. She advocates for her clients & works diligently to address client questions &/or concerns. 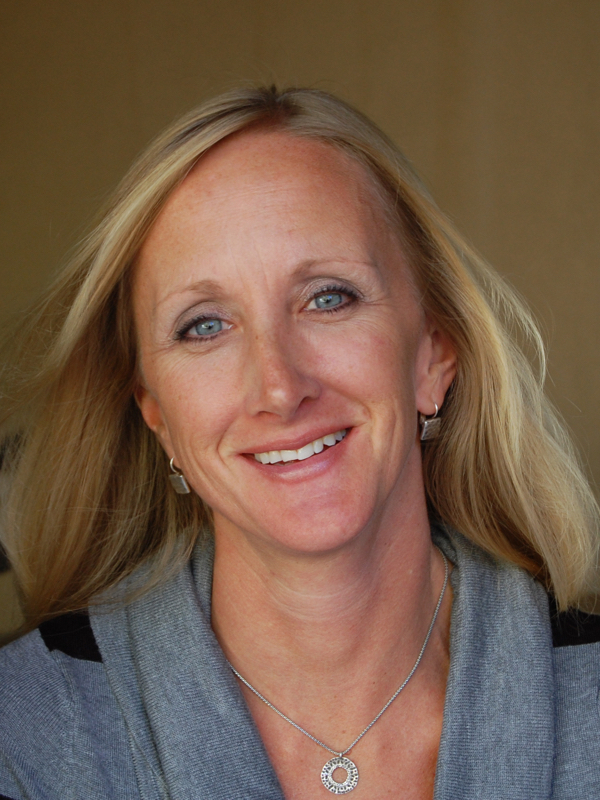 Amy's market knowledge & negotiation expertise is invaluable to you as her real estate client." Amy O’Connell was the BEST agent and she worked with me over years to help me to become a home owner once again!! Amy is an angel! Amy is a “people person” and puts her clients first and foremost. She never rushes her clients, giving them the feeling that they are her only concern at the moment. Amy is very knowledgeable and offers advice and suggestions throughout the process of looking at homes and the process of applying for a loan and closing. She stays in touch via phone or e-mail, checking to ensure that all is going well or offering services and help. We lived in Wyoming during our loan processing and closing and Amy was in contact with us to see that all was going well and if we needed her to do something for us. Amy did the walk-through of our new home to ensure that all work was completed and if any cosmetic touch-ups were needed. We very much appreciate her abilities, and friendship. She has stayed in contact with us since our move to Bernalillo, NM. We would certainly recommend her to family and friends. I couldn’t be more satisfied with the service I received, the questions I was asked, the homes, the methods, the flexibility, and last but not least the push to keep the hunt going until the right home was found. We wanted to let you know how much we appreciate everything that you did for us during our home buying process. The home inspector that you recommended gave us clear and concise information about the condition of our home and was extremely thorough . Your personal, hands on approach during the entire escrow process was much appreciated. I have never had an agent who kept us so informed, returned calls or texts as promptly, or who answered the hundreds of questions that we had with such a caring attitude the way that you did. We truly felt that you cared about us as people, even as friends, not just clients. Your personal touch didn't stop after we moved in either. Your recommendations for the different contractors that we would possibly need after the purchase of our 35 year old home were truly an added bonus. Not only did we use the roofing and hvac contractors that you recommended but when they gave us the estimates for the minor repairs that we needed and the repairs were started both of the contractors came back and informed us that not all repairs were going to be necessary after further inspection and the repairs were going to considerably less expensive than originally thought. Honest inspectors...honest contractors... What a concept ! Know that we will be forever grateful to you for the way you made our dream home a reality. I recently had the pleasant experience of working with Amy O'Connell of Coldwell Banker Legacy. 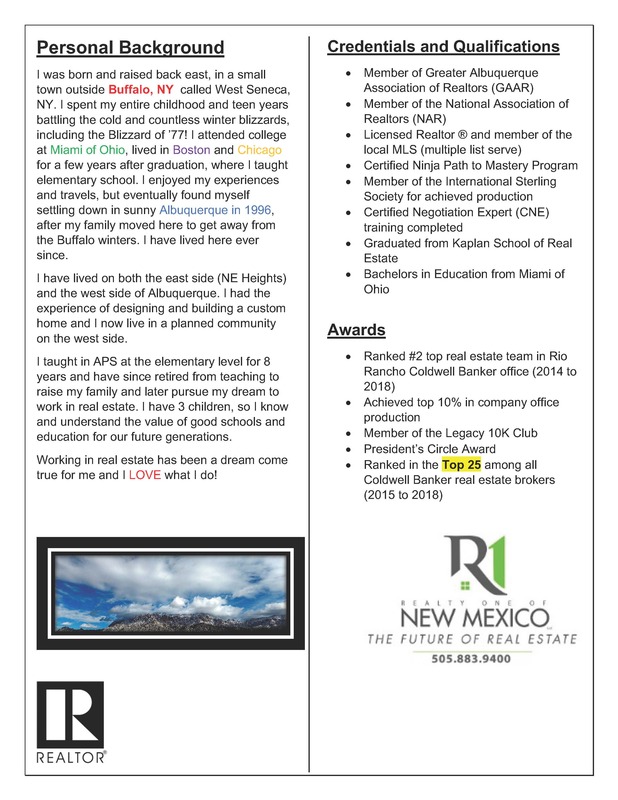 I was in search of an experienced & honest realtor who would help me in the search of a home in the Albuquerque area. Due to my situation my time & transportation were limited. Amy was always there to pick me up & show me homes that would be suitable for me in particular. She was always very pleasant & smiling. One thing that I noticed about Amy immediately, is how organized & intelligent she is. She would offer her professional advice & I thoroughly respected her opinion. Amy is not in the businesses for just a job & paycheck. I feel that she sincerely wants to help people & make them happy! I've been through a few sales & purchases of homes & know that it can be very stressful, but Amy made my purchase flow very smoothly. She was on top of things from the 1st inspection to the final closing. While reviewing everything along the way to make sure that it was in order & reminding me of what I needed to do, to keep things moving. Amy's staff & everyone who she recommended to work with was excellent also. I recall Amy saying to me after I had looked at a number of homes "there is no perfect home" But, Amy helped find the PERFECT home for me. Amy was very professional and always answered my questions promptly. Amy explained everything to me in simple terms, which made the process simple for me. Thank you Amy for all your hard work and professionalism! Amy was super responsive and always looking out for my best interests, with a very customer focused and professional attitude. Amy always made me feel that she was in control of all the situations and very knowledgeable of the market, providing me with a full sense of security and confidence. I am very happy and pleased with Amy O’Connell and the relator services that she provided to me. I’ve already recommended Amy’s services to others and she’s already got some business from my recommendation (and they are also happy and satisfied with Amy’s services). Amy O’Connell helped us in a lot of ways. She found contractors, plumbers and kept checking on the house for us. Amy held many open houses. She was more upset than we were when 2 buyers fell through and that helped us feel better. Amy was on top of things even before she met with us initially. She sent out almost daily updates. She stayed within our price and area guidelines. Amy was extremely cordial and a pleasure to work with. Our previous experiences were not nearly as positive as it was with her. We were extremely satisfied with her in every aspect.